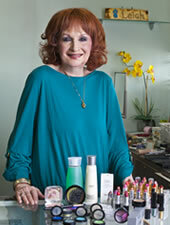 On April 11, 2011, at the age of 80, Leigh Lacoste unveiled her signature line of Leigh Lacoste cosmetics, the final touch in her new business as a personal makeup consultant. After more than six decades working for department stores in roles ranging from makeup artist to manager to cosmetics buyer, Leigh focused her expertise on the single part of the business she loved most: helping people feel good about themselves. Leigh’s inspiration to start her own business didn’t spring from one of the usual motives – like wanting to make more money or the freedom to be your own boss. Instead, she felt it was the only way to provide her clients with the best quality results and service. For Leigh, it was a way to achieve the highest level of excellence in her craft, and she seized the opportunity. Decades of work in the cosmetics industry taught Leigh that a positive self-image is essential for personal happiness and success. The effective use of cosmetics, she learned, can play a vital role in building confidence and self-esteem. Life experience has shown Leigh that makeup has less to do with a person’s external appearance than how they feel internally – their psyche and the way they perceive themselves within the world. She recognizes that makeup can provide a positive, therapeutic benefit and shouldn’t be dismissed as vanity or concealing one’s true identity behind a mask. Leigh’s clients have come from all walks of life…from unsung working women and mothers to legendary movie stars. Through years of experience she has learned that the most important thing to do with new clients is not to simply look at them and think of how to change their appearance, but to listen and learn about who they are. It’s the best of each person’s true self that Leigh Lacoste wants to make shine. Leigh Lacoste … Peoples Health Champion.